April 23, 2012 — We have positive news to report. Two weeks ago, we told Golden residents about a proposed bill that would have deeply eroded local control and could have allowed Jefferson Parkway proponents to push a toll road through Golden without considering the needs of our community. Today, we’re pleased to report that we’ve been told that the bill will not be introduced this legislative session. This very positive news is a testament to the focus and energy of citizens who have made their voices heard on these issues. We were also aided by the leaders of some neighboring cities who were concerned that the proposal overreached and undermined regional cooperation. While we don’t know yet exactly why the threat of the bill was withdrawn, we are grateful that cool heads prevailed. 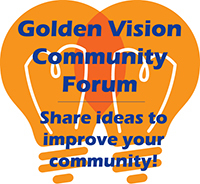 Golden has been and remains committed to productive dialogue with neighboring municipalities and counties about how to address the transportation challenges our region faces. But we made it clear that we could not productively discuss these issues with the threat of detrimental legislation hanging over our heads. We appreciate your continued interest in these issues and we’ll continue to update you on important developments as they occur.